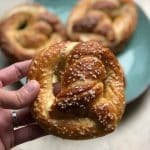 These delicious soft pretzels are a snap to make, and so much tastier than the ones at the mall. Take a bite of a homemade pretzel, fresh out of the oven, and you’ll never go back. The kids have entered a new stage in life, that I’m going to call The Always Hungry Phase. Even my rib-sticking Oatmeal-Cinnamon Waffles don’t fill them up like they used to. 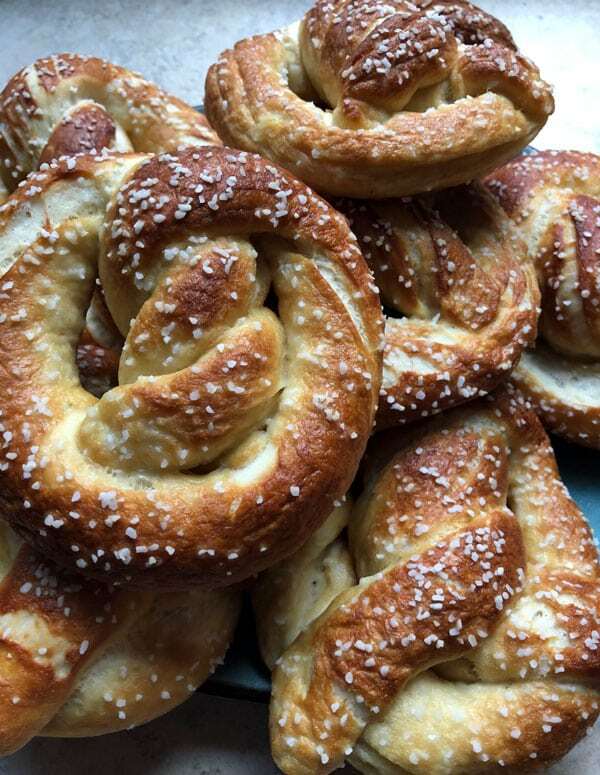 These soft pretzels are delicious, filling, and you know exactly what’s in them. They have a little bit of crunch, and a soft, tender interior that tastes great with homemade cheese sauce, grainy mustard, and even spaghetti sauce. Yum! 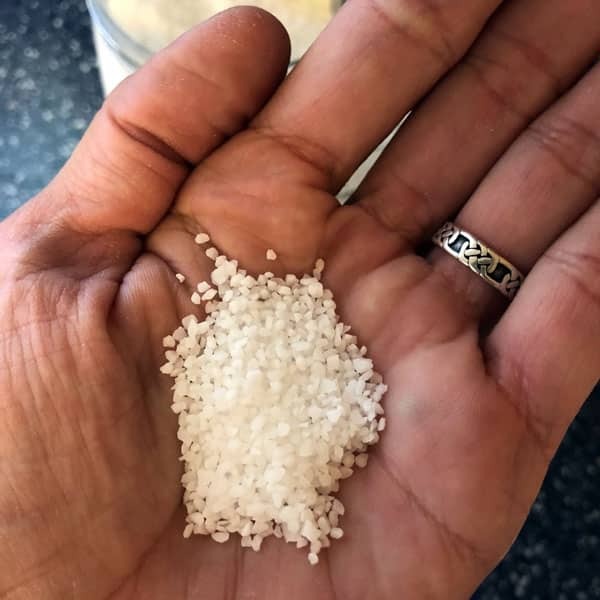 Pretzel salt: it’s different from table salt and won’t melt when baked. You can substitute with kosher salt if necessary. Combine the water, sugar, kosher salt, and yeast in the bowl of your mixer. Swish with a fork to combine and let it sit for a few minutes. Our house is pretty cold, so it’s hard to get yeast breads to rise in winter. If this is true for you also, turn your oven on to 200 degrees F and set the timer for 10 minutes—after that, turn the oven off. This will give your dough a nice, warm place to rise. Sift the flour into a separate bowl. 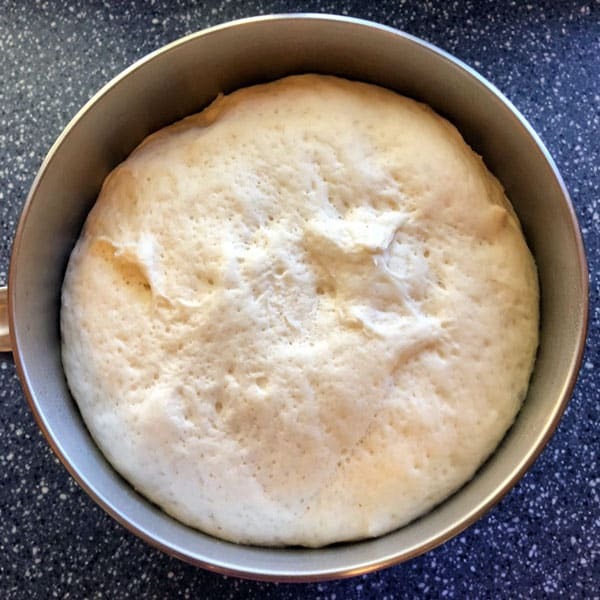 Once the yeast mixture has a few bubbles on top, add the flour and butter to the mixer bowl and mix on low with the dough hook until everything is combined. Then change to medium and knead for 4-5 minutes, until the dough pulls away from the sides of the bowl. Is your oven off? If it’s been on longer than 10 minutes, shut it off and leave the door open for a bit. Grab an ovenproof bowl and spray it with nonstick spray. 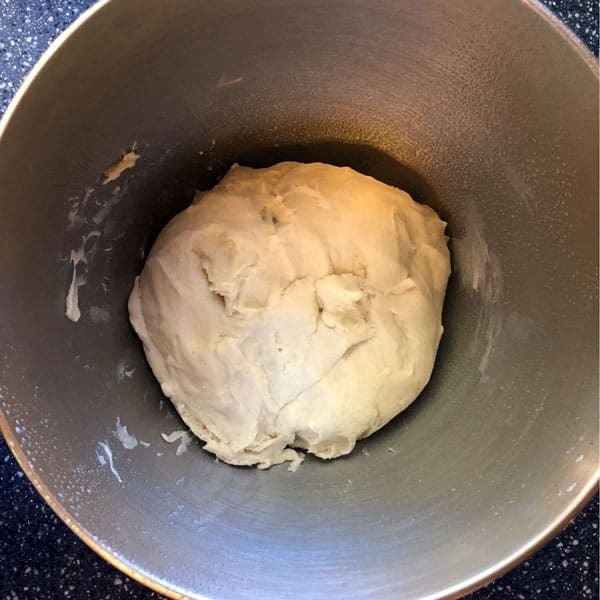 Put the dough in, cover the bowl with a damp towel, and place in the oven to rise. After about an hour, it will double in size and look like this. Bring it out of the oven and plop it on a clean, dry counter. 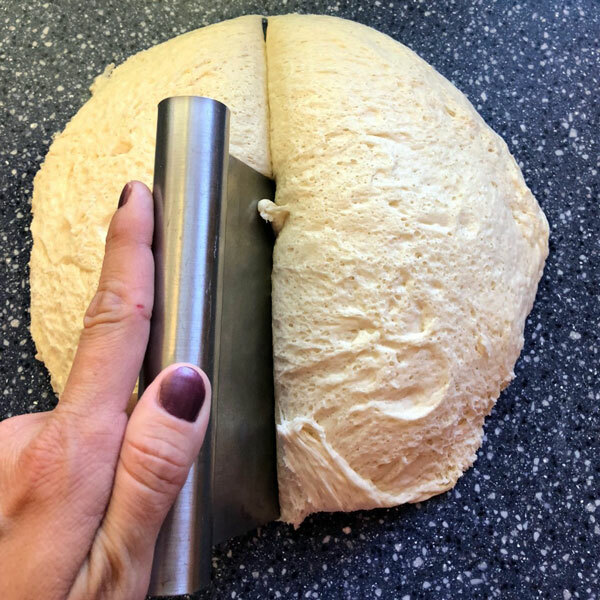 Divide the dough into eight equal pieces using your bench scraper. 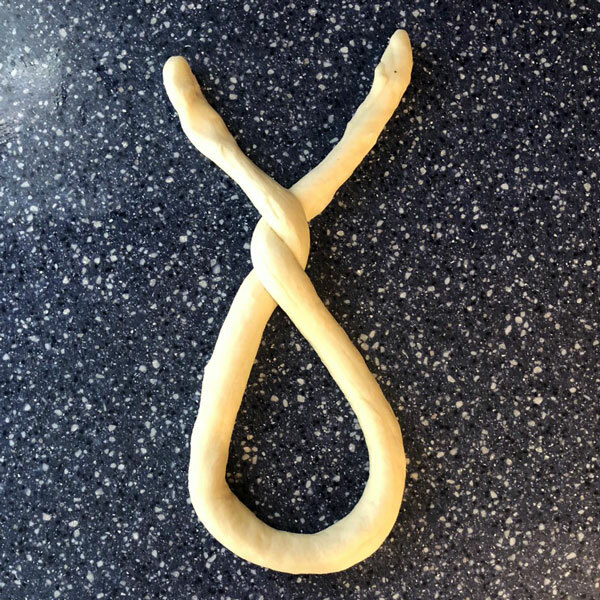 Roll each piece into a long rope. Reeeeeeally long…much longer than you think you’ll need. 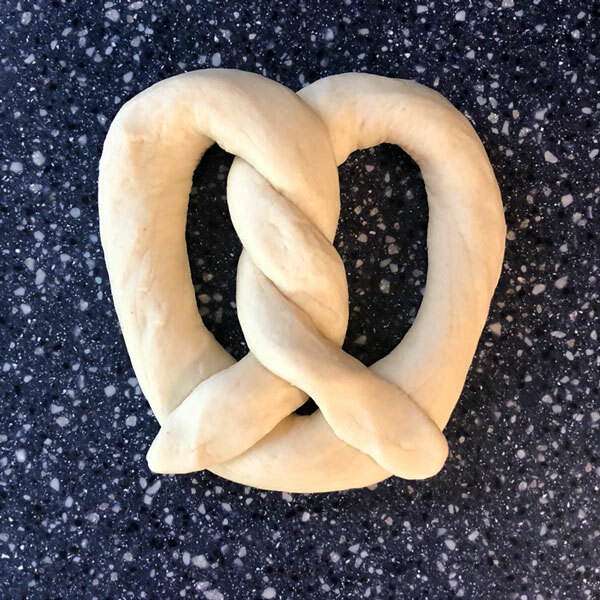 You’ll see why it needs to be so long when we twist it into a pretzel shape. 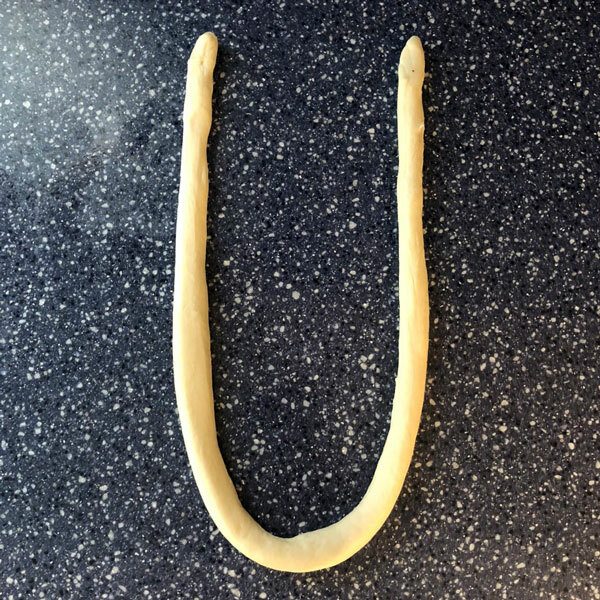 Start your pretzel by making a U with your dough rope. and stick the ends down with a dab of water. Shazam! You have a pretzel. Fire up the oven again, this time to 450 degrees F. Fill a large pan half-full with water and bring to a boil and add the baking soda. Do this carefully–it will really fizz up. Using your spider, slip the pretzels into the boiling water one at a time. Cook each one for 30 seconds, and then put them on a parchment-lined baking pan. Make an egg wash by mixing one egg and a tablespoon of water. 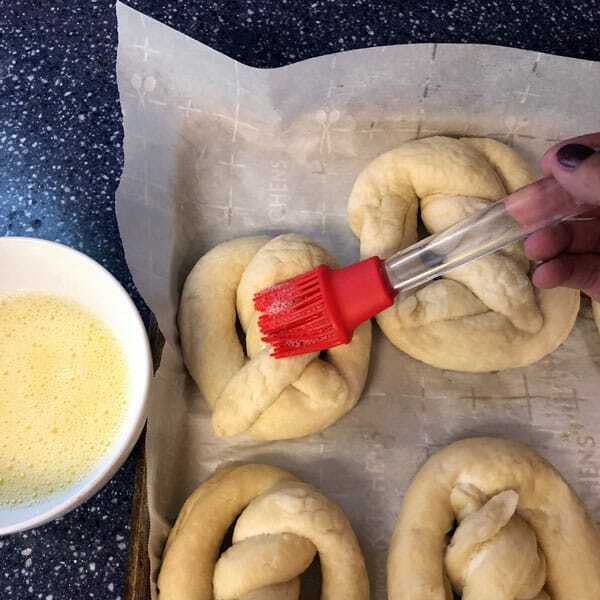 Once all of your pretzels are on the cookie sheet, brush them with the egg wash and sprinkle with pretzel salt. Bake until dark golden brown, about 12-14 minutes. Then place on a wire rack for a few minutes until they’ve cooled down enough to eat! Roll each piece into a long rope. Reeeeeeally long...much longer than you think you'll need. 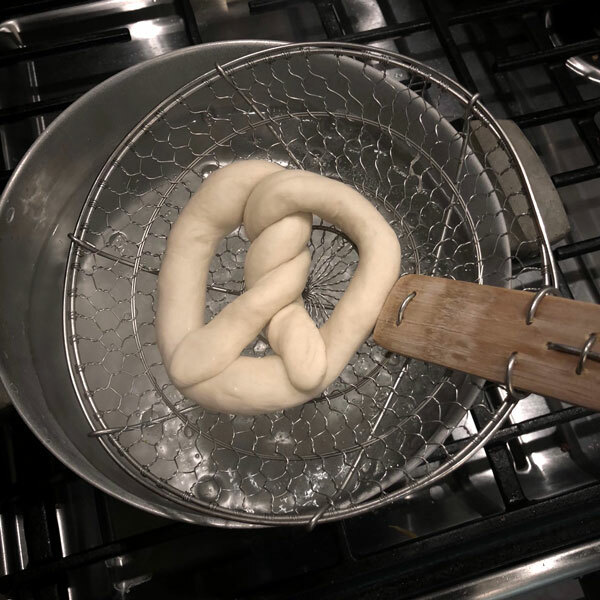 You'll see why it needs to be so long when we twist it into a pretzel shape. 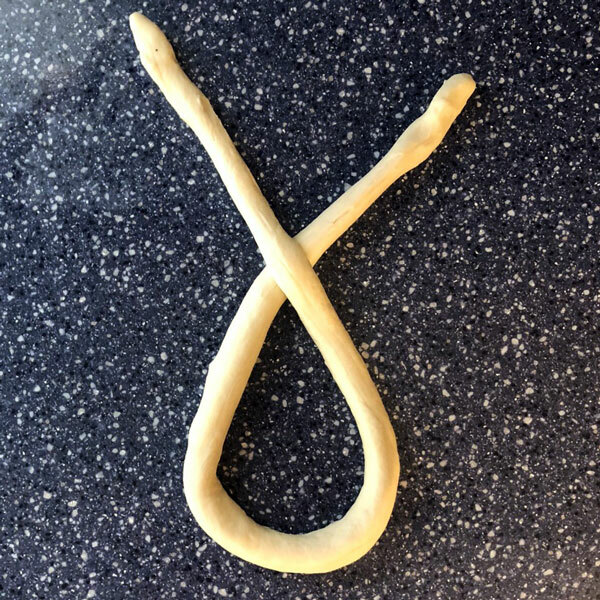 Start your pretzel by making a U with your dough rope. Cross the ends over each other, then cross them twice more, and stick the ends down with a dab of water. Shazam! You have a pretzel. Fire up the oven again, this time to 450 degrees F. Fill a large pan half-full with water and bring to a boil and add the baking soda. Do this carefully--it will really fizz up. 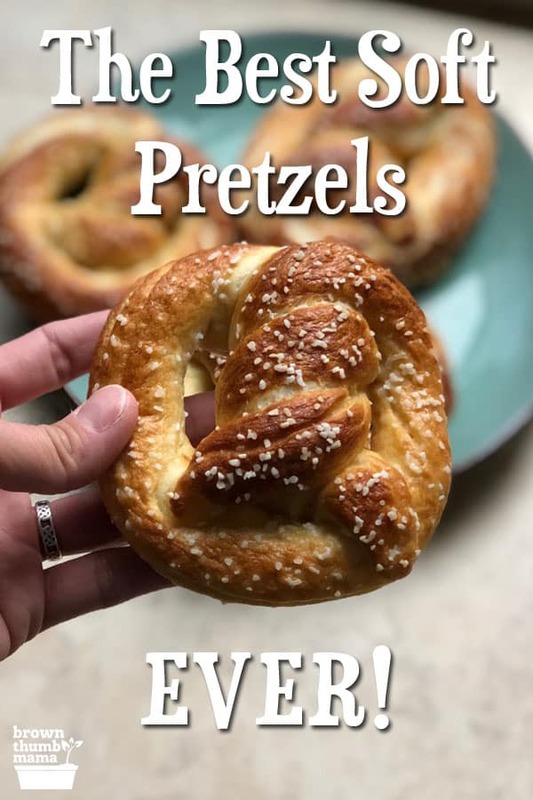 What will you serve with your pretzels? Those look yummy and I know my girls would love them. I am going to have to give them a try soon. I also find that because my house is cold the rise thing is tough, I take and boil a kettle of water then put my bread (in a glass bowl) in the oven pour the water into a shallow stone and close up the oven door. This is usually enough to warm and rise the dough. Would be interesting to know which method uses less energy as I would use the energy efficient method (probably about the same). I froze some of them to be toasted in the toaster oven by #24 when he is hungry. He is always hungry since he is 9, so this isn’t going to be around too long. At what point did you freeze them? Before cooking, or after? Ray, I froze them after cooking. wow!! These look AWESOME. Not overly complicated. And I miss soft pretzels. Thanks for bringing them back to me! Can you use instant yeast? My boys would love these! Absolutely! You’ll use a bit less than 2 teaspoons of instant yeast. Pretty good. I would bake mine less than 11 minutes though, because after 11 minutes, the bottoms were just too dark to be tasty. Thanks for sharing. Thanks so much! These turned out great and were a perfect Lenten treat! We had a great time making them! Your photos and steps were very easy to follow.